When children feel safe and supported and are aware of their responsibilities, they are more likely to give their best effort. Create a climate during MTP that encourages children to participate, challenge themselves, and support one another. Your physical environment is one tool you can use to help children meet these goals. An organized space where you and your children have what they need at their fingertips is supportive. When you have materials you need on hand, and children have what they need for reference or to demonstrate their understanding, instructional time is maximized. The whole group meeting area builds a sense of community. It makes it easier for the children to see the board and allows for more interaction among children so they can share their thinking. Make sure to have the rug itself arranged horizontally (instead of vertically) so the children will be closer to the board. 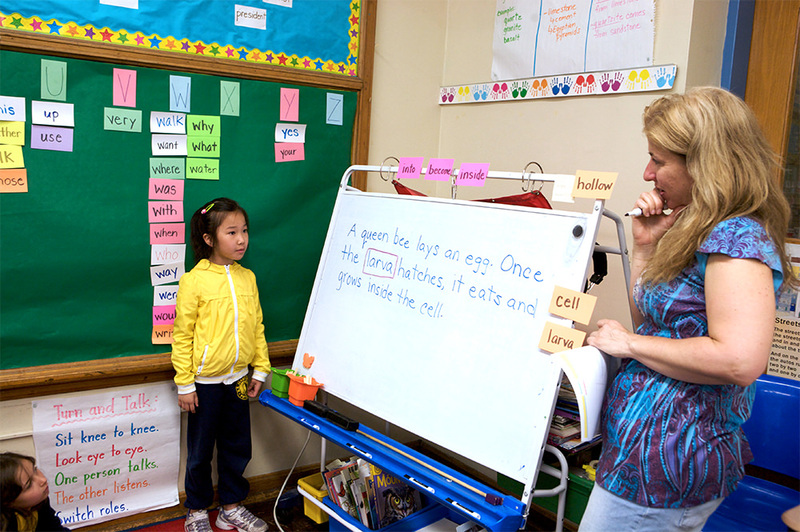 The board should be close to the word wall in order to reference it and interact with the words on it. For Message Time Plus to have the biggest impact on children’s reading and writing skills, it is helpful for them to understand the routines around this instructional practice and their responsibilities during it. Procedures that you plan and model, give the children practice with, and then reflect upon will be the ones that are most effective. While the children in your classroom have their own set of unique strengths, interests, and needs, below is a list of common procedures that will help ensure their success during MTP. Songs are a fun way to help children learn. Use these songs to transition your children to the large group meeting area or to gain everyone’s attention once they are seated there. and slowly, quietly sits right down. Hands and feet are quiet.